We’re still reeling under the food high from the festivities of last week. So while we’re doing our best to eat healthy, a bit of indulgence doesn’t hurt. Especially if it is something as flavourful as a plateful of fragrant risotto. 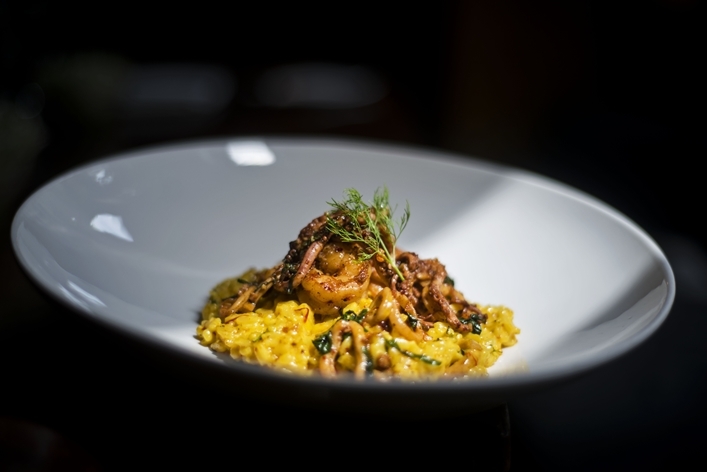 Instead of heading out to eat, we get from chef Jaydeep Mukherjee, Corporate Executive Chef, deGustibus Hospitality (Indigo, Indigo Deli, Neel, Tote on the Turf) to share his recipe of a creamy risotto with us. With prawns, calamari and clams, the dish packs in a lot of taste and goodness. Add the rice – straight out of the packet, and sauté well to toast the grains lightly. The grains should become translucent on the outside with a visible white core inside. Add the white wine to the rice and stir well. The rice will absorb the wine and begin to swell. Add the seafood, seared earlier, to the risotto, tear the basil leaves and stir into the rice.